Superfocus Lenses Do Away With Bifocals | OhGizmo! This product has likely been around since forever, but it’s a first for us. Superfocus glasses are an alternative to bifocals. A progressive slider on the bridge lets you adjust the lenses’ focal point, so that you can see near or far with the entire viewing area, rather than being confined to a small are on the bottom. Each “lens” is actually a set of two lenses, one flexible and one firm. 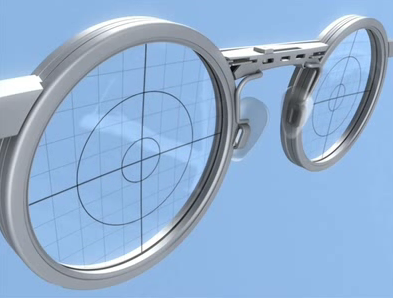 The flexible lens (near the eye) has a transparent distensible membrane attached to a clear rigid surface. The pocket between them holds a small quantity of crystal clear fluid. As you move the slider on the bridge, it pushes the fluid and alters the shape of the flexible lens. Changing the shape changes the correction. This mimics the way the lenses in your eyes used to perform when you were younger. This allows you to choose the exact correction that works best for you at any distance and under any lighting conditions. They appear to come in only one style, John Lennon. And they’re not cheap, not one bit: $700+. You have to call or customize online to get an exact quote. FWIW, Josh Silver has been working on them since 1985, and his goals are to reduce the cost to one dollar a pair and have one billion people (mostly in developing nations) wearing them by 2020.